But fascism has developed a meaning beyond its origin reference, and that meaning is very important in today’s world, because there are real fascists on the rise. Because of this, I think we need to stop using “fascist” as a simple pejorative for people on the right who we consider beyond the pale, and start using it precisely and clearly. 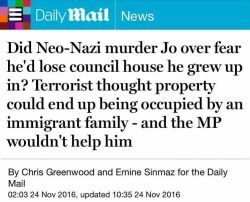 And in that vein, I want to say: the Daily Mail is a fascist newspaper. Wikipedia starts its entry defining fascism as “a form of authoritarian nationalism.” I want to suggest that this is not exactly correct: that though authoritarianism is a natural and willing bedpartner of fascism, it is not an intrinsic part of it. I propose that fascism, it its modern sense, should be seen a social project: it is a means, not an ends. It is an obvious tool of those who desire to lead in an authoritarian manner, but it is used by other individuals and organizations to achieve other ends. To me, fascism consists of three major components: the demonization of a marginalized section of society as responsible for societal ills, the inculcation of fear and hatred in the populace directed at that group, and the promotion of unreason in public discourse. The fascist seeks a pliant populace—though not necessarily, as I have indicated, to rule over. In order to do so, they require to divert attention from the institutions and individuals who a reasoned mind would consider the source of social ills. Kicking down—demonization—is the strategy they promote. Instead of looking upwards to those in power for the origins of their problems, the populace are encouraged to look downwards to an already marginalized group; a simple bait-and-switch manoeuvre. But this is, of course, not a particularly reasonable position to hold, by definition the marginalized group are highly unlikely to have the power to adversely affect people’s lives. So the populace must be encouraged to put aside their reason, and the strategy the fascist chooses for this is fear: fearful people’s amygdalas get in the way of their reason. There is then a twin-pronged approach: the demonized group are made into something to fear, which encourages unreason; that unreason then allows the fascist to increase their claims about that group, thus encouraging more fear. If I were a proper sociologist, I would probably now draw a triangle of double-headed arrows, with the words “fear,” “unreason,” and “demonization” at each apex, and believe that in doing so I had proven my point beyond question. Being a poor sociologist, I leave you diagramless, and will happily acknowledge that this is merely a suggested definition. The point here is, we see this everywhere at the moment, and it is not necessarily accompanied by authoritarianism. Nigel Farage is, of course, a fascist: and that the media have spent the last fifteen years treating him as a harmless amusement rather than calling him out on this is a great part of his success. Yet he, clearly, is too lazy to be interested in actual power. He wanted one thing, which he got, and then ran from the consequences, at least until another fascist took him up and stroked his ego. But the point I want to make here is that, without doubt, the Daily Mail is a fascist newspaper. That is, it is not just an organ of fascists, it is in itself fascist. It trades in demonization, fear, and unreason: not just in its social reporting. It is something of a joke how obsessed it is with cancer and identifying Things That Cause It. Experts, not just in the political sphere, are treated with disdain and hatred—except, of course, when they produce research than may be misrepresented to enhance their fear agenda. Immigrants, single mothers, immigrants, and more immigrants are repeatedly blamed for all social ills. But Paul Dacre, fascist though he may be, does not seek personal authoritarian power and one sees no evidence that he would embrace such a leader; though he is an enthusiastic proponent of the social project that such leaders adore. The ends Paul Dacre, and his boss Viscount Rothermere, seek with their fascism are more mundane: to sell newspapers and make money. They might well decry a truly authoritarian leader, but they are part—no, major players—in the social project that is modern fascism, and which will enable those individuals who do seek absolute power. By placing the blame for a white supremacist ultra-nationalist terrorist murder, against all reason, at the door of the very group that that vile individual hated, and in passing suggesting that other members of the populace should fear that group, the Daily Mail have, in one headline, perfectly encapsulated their fascist project.